Mandarin Oriental, Paris will host a pioneering Chef from its sister hotel in Marrakech for an exclusive Moroccan Gastronomic Week. As head of Mes’Lalla restaurant at Mandarin Oriental, Marrakech, Chef Salim Ait Ezzine is renowned for his inspired reinterpretations of Moroccan classics, which he will recreate for Paris diners from 17 – 21 September 2018. Using seasonal ingredients, Chef Ait Ezzine will present flavoursome Moroccan dishes at Camelia, the all-day dining restaurant at Mandarin Oriental, Paris headed by Chef Thierry Marx. Included as options on the daily Camelia lunch menu and presented as a special four-course tasting dinner menu, Chef Ait Ezzine’s Moroccan delights will feature Mes’Lalla specialties, such as ‘Artichoke poivrade Moroccan style eggplant caviar with purple olives and coriander foam’. Also served will be ‘Turbot fish m’quali, radish and turnip cooked with meslalla olives’ and ‘Cockerel m’hamer with preserved lemon, Couscous with caramelized onions and Muscat grapes’. Desserts include a selection of thin Moroccan pastries, ‘Sliced fresh orange with cinnamon’ and ‘Jawhara pastilla with light cream’. To celebrate Chef Ait Ezzine’s week at Camelia, the Head Barman at Mandarin Oriental, Paris’s bar 8, Judicaël Noël, has created the ‘Marrakech Nassim’ cocktail, made from eau de vie infused with fresh mint and figs, honey syrup with sesame seed, date bitter, Aloe Vera juice and lemon juice. Born to a family of cooks, Chef Ait Ezzine began his career at the hotel Relais & Châteaux Ksar Char-Bagh in Marrakech before heading to the Middle East where he perfected his knowledge of French gastronomy alongside Chef Taiffour. Eager to explore different culinary styles, Chef Ait Ezzine mastered Italian cuisine at Hôtel Delano in Marrakech before becoming Head Chef at Royal Palm. A meticulous perfectionist, who places considerable importance on discipline and sharing know-how, Chef Ait Ezzine joined Mandarin Oriental, Marrakech in September 2017. The four-course dinner tasting menu is priced at EUR 78 or EUR 98 with two glasses of paired wine. The three-course daily Camelia lunch menu, which features a selection of Chef Ait Ezzine’s dishes, is priced EUR 68. The ‘Marrakech Nassim’ cocktail, mixed at bar 8, is on offer at EUR 29. Guests can treat themselves to the Moroccan Gastronomic Week and everything else the five-star Mandarin Oriental, Paris has to offer, by booking a room at the palace’s favourable bed and breakfast rate. This includes full daily breakfast to enjoy on the hotel’s garden terrace, a peaceful spot in late summer. Available year round, bed and breakfast start from EUR 1,239 per night for a Deluxe room. For restaurant information and reservations, please call +33 70 98 74 00 or email mopar-restauration@mohg.com. For room reservations, please visit www.mandarinoriental.com/paris. 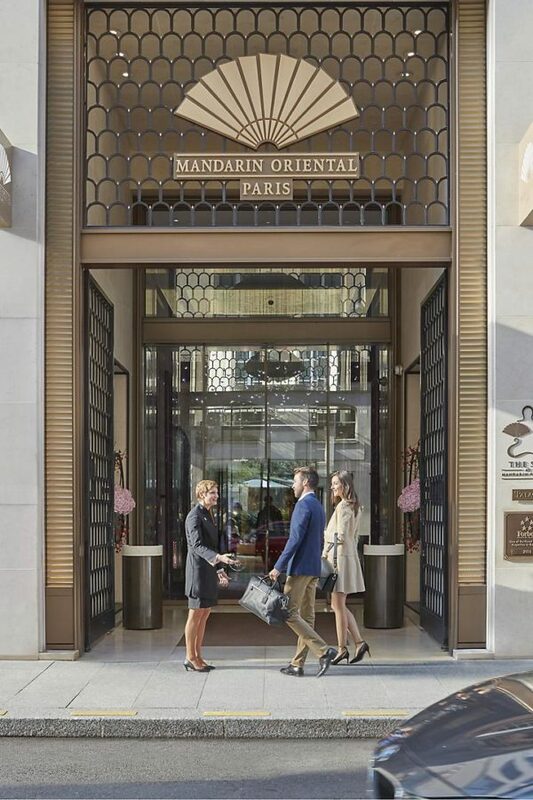 Mandarin Oriental, Paris is a celebration of Paris today and tomorrow, inspired by fashion and artistic creativity and underpinned by the brand’s legendary service. This truly Parisian five-star hotel provides an oasis of tranquillity and a cocoon of luxury. The 98 chic and elegant rooms and 40 spacious suites offer guests an exceptionally stylish Parisian experience with their nod to couture and unique art pieces. Located in the very heart of the city, the hotel’s best-kept secret is its inner garden providing a sanctuary from the bustling city and a peaceful dining haven. A wide range of dining options is overseen by celebrated Chef Thierry Marx, including two-Michelin starred, fine-dining restaurant, Sur Mesure, all-day dining Camélia, a Cake Shop by Mandarin Oriental, a cool cocktail bar, as well as L’Honoré serving health-conscious cuisine. Finally, the Spa at Mandarin Oriental offers unique wellness and relaxation experiences, in a soothing, contemporary environment, featuring luxurious private treatment rooms, an indoor pool and a state of the art fitness centre. Mandarin Oriental, Paris is the preferred choice of discerning travellers who believe they have found the city’s best kept secret address. Disclaimer: The Daily Brunch does not hold the rights to image.